Brick Kiln Cottage01263 715779work01603 870304fax Self-cateringBrick Kiln Cottage is set within the quiet country lanes on the outskirts of North Walsham. A perfect get away for two which although attached to the owners house has the benefit of the country gardens with free roaming chickens, beehives in the orchards, a large pond with field views beyond. Enjoy your creature comforts with snuggly siberian goose down duvet and William Morris bedding. Dine in style with Denby crockery in front of the woodburner on a cooler day or sit on the patio and enjoys a meal alfresco enjoying the countryside views. Brick Kiln Cottage offers weekly bookings starting on Friday. 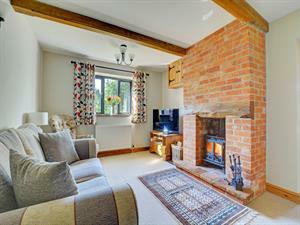 Brick Kiln Cottage is set within the quiet country lanes on the outskirts of North Walsham. A perfect get away for two which although attached to the owners house has the benefit of the country gardens with free roaming chickens, beehives in the orchards, a large pond with field views beyond. Enjoy your creature comforts with snuggly siberian goose down duvet and William Morris bedding. Dine in style with Denby crockery in front of the woodburner on a cooler day or sit on the patio and enjoys a meal alfresco enjoying the countryside views.